Press Release - Avon has collaborated with James Bond entertainment to create the first ever Bond-inspired fragrance for women, Bond Girl 007. Exclusively for Avon, Bond Girl 007 brings the confident allure of cinema’s sexiest icons to women worldwide, representing intelligence, sexiness and empowerment. 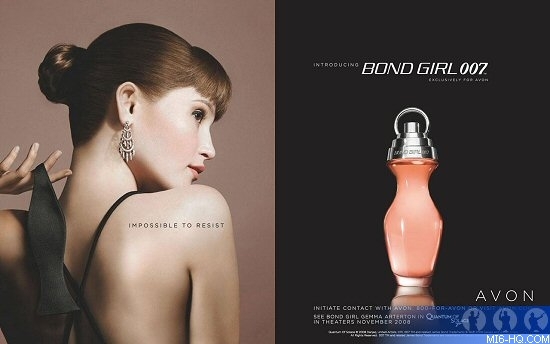 British actress Gemma Arterton, who plays the role of Agent Fields in the upcoming Bond film, will front the new fragrance. She will appear in TV and print advertising when Bond Girl 007 launches globally in October 2008 in conjunction with the worldwide release of “Quantum of Solace”, the 22nd film in the Bond series, which is the largest and longest running movie franchise in history. Bond Girl 007 is housed in a sleek, seductive bottle reminiscent of a female figure. The cap is a stealthy homage to a Bond spy gadget. “The iconic Bond girls are one of the most widely known aspects of the films - they’re empowered, feminine and glamorous, so we’re extremely pleased to capture that essence in our newest fragrance,” said Geralyn Breig, Senior Vice President and Brand President for Avon.